In your browser, navigate to the UEM Test Page (e.g: http://<account-name>.dynatracesaas.com). Extract the dtagent script tag from the source of this page. Then include it in the header of your page before any other script. Make sure you specify the correct path to the location on your server. Open the AppMon Webstart Client (see Access your Instance). Monitor request path (e.g: http://<account-name>.dynatracesaas.com/dynaTraceMonitor) See below for more details. 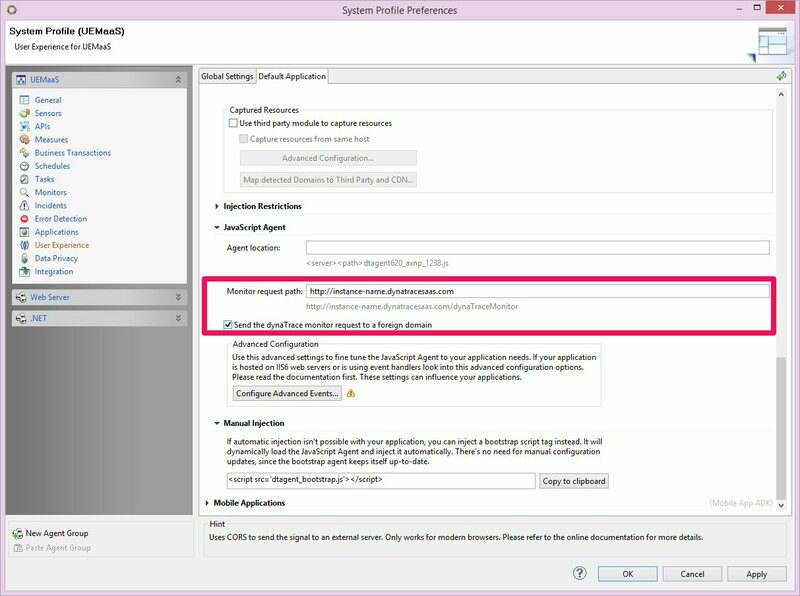 Enable the option Send the dynaTrace monitor request to a foreign domain. Navigate to your website and verify the result in the Dynatrace Client. Some instances still use compuwareapmaas.com instead of dynatracesaas.com. Please refer your welcome email to find out which domain is used by your instance.